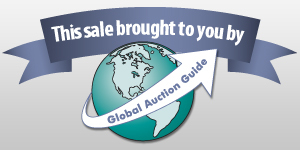 LIVE AUCTION TERMS: Cash, NYS Check, M/C, Visa, Debit or Discover. Acceptable I.D. Required. 13% Buyer?s Premium with 3% Discount for Cash or Check. ? ALL ABSENTEE BIDS HAVE A 13% Buyer's Premium and credit cards will be charged immediately following the auction.- If you place absentee bids and come to live auction you will still pay 13% buyer's premium if we are bidding for you. * If there is a tie bid between your absentee bid and the crowd in live attendance, the live bidder wins the bid. ** If you are tax exempt you MUST notify us prior to the close of the auction, along with a copy of the form, if not you will be charged tax. We cannot remove tax once the card has been processed. Acceptance of Terms: Buyers registering for and using Hessney bid cards, placing bids online agree to the following Terms of Sale, which you agree with when you check the box when you register, and place first bid:******Everything is sold AS IS, WHERE IS. All Sales are Final- No Returns.Hessney Auction Co. provides ample opportunity for buyers to thoroughly inspect goods to be sold. All purchases should be made on the buyer's own recognizance. All persons bidding in absentee who have not physically inspected the goods prior to the sale are also subject to these terms. All lots are sold "As is". There are no warranties expressed or implied, including, but not limited to warranties of merchantability or fitness for a particular purpose. Hessney Auction Co. and consigners make no guarantee or warranty as to the authenticity of the merchandise, the correctness of the catalog, nor shall any description (oral or written) of condition, size, quality, rarity, importance or provenance be deemed a guarantee. **This is a public auction and not a retail setting. All Sales are FINAL. No returns or chargebacks are accepted. *Some items may be sold per piece. The bid price is multiplied by the amount of items in the lot. This is shown on the catalog using the bid price x quantity. (EXAMPLE- "12.50 x 4" equals a total bid of $50.00. )Buyers Premium:All sales are subject to a Buyer's Premium; reference to the buyer's premium is made in auction advertisments, flyers and catalogs. Buyer's premium will be a stated percentage and must be paid by the buyer as part of the purchase price. 2- Civil War store card tokens, Fort Edward, N.Y.
2- Civil War store card tokens, Whitehall, N.Y.
Mixed lot, early Jefferson nickels, 150 pcs. Lot, foreign currency, 28 pcs. Lot, foreign currency, 20 pcs. Lot, foreign currency, 41 pcs. Lot, foreign currency, 55 pcs. Lot, foreign currency, 7 pcs. Lot, early bank checks, 3 pcs. Lot, reproduction Confederate currency, 3 pcs. Partial set Indian head cents 1859-1909, 47 pcs. Partial set Lincoln cents 1909-1974, 162 pcs. Partial set Lincoln cents 1941-1974, 177 pcs. Partial set Buffalo nickels 1913-1938, 23 pcs. Partial set Buffalo nickels 1913-1938, 53 pcs. Partial set Roosevelt dimes 1965-2003, 74 pcs. Partial set Jefferson nickels 1962-1996, 67 pcs. Partial set Sacagawea dollars, 6 pcs. Lot, Canadian silver coins, 4 pcs. Lot, miscellaneous foreign silver coins, 15 pcs. Lot, foreign coins, 25 pcs. Lot, foreign coins, 95 pcs. Lot, foreign coins, 98 pcs. Lot, foreign coins, 120 pcs. Lot, wheat cents, 1458 pcs. Lot, wheat cents, 1000 pcs.